Zen, Simone (2014) Bio-morphodynamics of evolving river meander bends from remote sensing, field observations and mathematical modelling. PhD thesis, University of Trento, Queen Mary University of London. Interactions between fluvial processes and vegetation along the natural channel margins have been shown to be fundamental in determining meandering rivers development. By colonizing exposed sediments, riparian trees increase erosion resistance and stabilize fluvial sediment transport through their root systems, while during a flood event the above-ground biomass interacts with the water flow inducing sediment deposition and altering scour patterns. In turn river dynamics and hydrology influence vegetative biomass growth, affecting the spatial distribution of vegetation. These bio-morphological dynamics have been observed to direct control accretion and degradation rates of the meander bend. In particular, vegetation encroachments within the point bar (i.e. colonizing species and strand wood), initiate pioneeristic landforms that, when evolving, determine the lateral shifting of the margin that separates active channel from river floodplain and thus inner bank aggradation (bar push). This diminishes the portion of the morphologically active channel cross-section, influencing the erosion of the cutting bank and promoting channel widen- ing (bank pull ). As a result of the cyclical occurrence of these erosional and depositional processes, meandering rivers floodplain show a typical ridge and swale pattern characterized by the presence of complex morphological structures, namely, benches, scrolls and chutes within the new-created floodplain. Moreover, difference in migration rate between the two banks have been observed to induce local temporal variations in channel width that affect river channel morphodynamics and its overall planform through their influence on the local flow field and channel bed morphology. Despite enormous advances in field and laboratory techniques and modelling development of the last decades, little is known about the relation between floodplain patterns and their controlling bio-morphological interactions that determine the bank accretion process. This knowledge gap has so far limited the development of physically-based models for the evolution of meandering rivers able to describe the lateral migration of banklines separately. Most existing meander migration models are indeed based on the hypothesis of constant channel width. Starting from this knowledge gap, the present doctoral research has aimed to provide more insight in the mutual interactions among flow, sediment transport and riparian vegetation dynamics in advancing banks of meandering rivers. In order to achieve its aims, the research has been designed as an integration of remote sensing and in-situ field observations with a mathematical modelling approach to i) provide a quantitative description of vegetation and floodplain channel topography patterns in advancing meanders bend and to ii) explore the key control factors and their role in generating the observed patterns. The structure of the present PhD work is based on four main elements. First, two types of airborne historical data (air photographs and Lidar survey) have been investigated, in order to quantify the effects of spatial-temporal evolution of vegetation pattern on meander morphology and to provide evidence for the influence of vegetation within the topography of the present floodplain. Such remote sensing analysis has highlighted a strong correspondence between riparian canopy structure and geomorphological patterns within the floodplain area: this has clearly shown the need to interpret the final river morphology as the result of a two-way interaction between riparian vegetation dynamics and river processes. Second, field measurments have been conducted on a dynamic meander bend of the lower reach of the Tagliamento River, Italy, with the initial aim of checking the outcomes of the remote sensing analysis through ground data. The outcomes of the field measurements have further supported the results, providing ground evidence on the relations between vegetation and topographic patterns within the transition zone that is intermediate between the active channel bed and the vegetated portion of the accreting floodplain. The influence of vegetation on inner bank morphology has also been interpreted in the light of the expected time scales of inundation and geomorphic dynamics that characterize the advancing process of the inner bank. The combined analysis of both remotely sensed data and field measurements associated with the historical hydrological dataset have allowed to quantitatively characterize the biophysical characteristics of the buffer zone, close to the river edge, where the accretion processes take place. The third research element has foreseen the development of a biophysically-based, simplified bio-morphodynamic model for the lateral migration of a meander bend that took advantage of the empirical knowledge gained in the analysis of field data. The model links a minimalist approach that includes biophysically-based relationships to describe the interaction between riparian vegetation and river hydromorphodynamic processes, and employs a non linear mathematical model to describe the morphodynamics of meander channel bed. Model application has allowed to reproduce the spatial oscillations of vegetation biomass density and ground morphology observed in the previous analyses. Overall, the model allows to understand the role of the main controlling factors for the ground and vegetation patterns that characterize the advancing river bank and to investigate the temporal dynamics of the morphologically active channel width, providing insights into the bank pull and bar push phenomena. The fourth and concluding element of the present PhD research is a analytical investigation of the fundamental role of unsteadiness on the morphodynamic response of the river channel. Results obtained in the previous elements have clearly showed the tendency of a meander bend to develop temporal oscillations of the active channel width during its evolution, but no predictive analytical tool was previously available to investigate the channel bed response to such non-stationary planform dynamics. A non linear model has therefore been proposed to investigate the effect of active channel width unsteadiness on channel bed morphology. The basic case of free bar instability in a straight channel has been used in this first investigation, which has shown the tendency of channel widening to increase river bed instability compared to the steady case, in qualitative agreement with experimental observations. 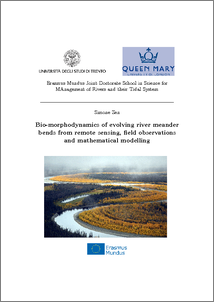 Overall, the research conducted within the present Doctoral Thesis represents a step forward in understanding the bio-morphodynamics of meandering rivers that can help the development of a complete bio-morphodynamic model for meandering rivers evolution, able to provide support for sustainable river management.